Today, DIY—do-it-yourself—describes more than self-taught carpentry. Social media enables DIY citizens to organize and protest in new ways (as in Egypt’s “Twitter revolution” of 2011) and to repurpose corporate content (or create new user-generated content) in order to offer political counternarratives. This book examines the usefulness and limits of DIY citizenship, exploring the diverse forms of political participation and “critical making” that have emerged in recent years. The authors and artists in this collection describe DIY citizens whose activities range from activist fan blogging and video production to knitting and the creation of community gardens. 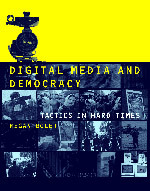 Digital Media and Democracy: Tactics in Hard Times (MIT Press, 2008) Publisher’s profile page, with free download of Introduction here. In an age of proliferating media and news sources, who has the power to define reality? Today, the “social web” – epitomized by blogs, viral videos, and YouTube – creates new pathways for truth to emerge and makes possible new tactics for media activism. Leading scholars in media and communication studies, media activists, journalists, and artists explore the contradiction at the heart of the relationship between truth and power: the radical democratization of knowledge and the multiplication of sources and voices, made possible by digital media, coexist with the blatant falsification of information by political and corporate powers. The book maps a new digital media landscape that features citizen journalism, The Daily Show, blogging, and alternative media. The contributors discuss broad questions of media and politics, offer nuanced analyses of change in journalism, and undertake detailed examinations of the use of web-based media in shaping political and social movements. The chapters include not only essays by noted media scholars but also interviews with such journalists and media activists as Amy Goodman of DemocracyNow!, Media Matters host Robert McChesney, and Hassan Ibrahim of Al Jazeera. How can discerning critical hope enable us to develop innovative forms of teaching, learning and social practices that begin to address issues of marginalization, privilege and access across different contexts? At this millennial point in history, questions of cynicism, despair and hope arise at every turn, especially within areas of research into social justice and the struggle for transformation in education. While a sense of fatalism and despair is easily recognizable, establishing compelling bases for hope is more difficult. This book addresses the absence of sustained analyses of hope that simultaneously recognize the hard edges of why we despair. 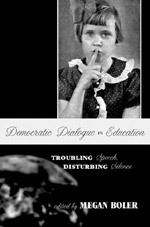 Drawing from disciplines of philosophy, political theory, critical race theory, sociology, and feminist and post-structural studies, the essays in Democratic Dialogue in Education examine issues arising from the conceptualizing of hate speech, freedom of expression, speech codes and political correctness, and voice and agency. What are the limits of speech in classrooms, and how are classrooms distinct from other kinds of public space? How do we understand silence as well as speech within the field of cultural differences at play in educational spaces? Questions of social justice, equity, racial identities and sexual differences are central to the pedagogical philosophies and practices addressed by these diverse scholars. In Feeling Power Emotions and Education (Routledge 1999) Megan Boler combines cultural history with ethical and multicultural analyses to explore how emotions have been disciplined, suppressed or ignored at all levels of education and educational theory. Feeling Power begins by charting the philosophies and practices developed over the last century to control social conflicts arising from gender, class and race. The book traces the development of progressive pedagogies from civil rights and women’s liberation movements, to the author’s recent studies of “emotional intelligence” and emotional literacy.” She concludes by outlining a “pedagogy of discomfort” that examines the empathy, fear and anger to negotiate ethics and difference. Drawing on the formulation of emotion as knowledge within feminist and poststructuralist theories, Boler develops a unique theory of emotion missing from contemporary philosophical and theoretical discourses.